It was wonderful. Thanks for finding the best and bringing it home. Your efforts are appreciated. Gwen, this looks delightful. And the comment from Mr. Bunkycooks is so sweet. Isn’t it satisfying to go that extra mile and have it be appreciated? We are lucky women that way. Your photos knock me into tomorrow! So pretty! And this recipe sounds fantastic. I’ll be giving it a try soon, but with a more standard pumpkin. I’ve yet to see one embroidered with warts. Thanks for reminding me how much of a difference homemade stock makes I can almost taste it alone! Thank you so much for your comment! I will be posting the recipe I use for homemade stock very soon and yes, it definitely makes a huge difference in soups and stews. I would suggest that you use a Sugar Pie Pumpkin or a Cinderella Pumpkin, if you can find them. You will need several of the Sugar Pies to make the entire recipe, but the Cinderella ones are usually quite large. I am certain that the flesh from this pumpkin gave it the unique flavor, but one that is sweeter should be okay to substitute. I may head back to the market before they close this weekend and see if I can get another (like I need another pumpkin!). It was that good. I hope you find one! Oh my word!! That is a funky looking pumpkin!! I’m not sure whether I think it attractive or not LOL I love though how tiny the seed cavity is inside – more meat!! The colour is outstanding, and all those aromatic herbs in the soup must have made this truly incredible!! They are not all quite this spooky looking. Some are not totally covered in the wart-like coating this one was, but they all do have some of it. It is definitely funky! I love these French squash and they are very prolific and easy to grow IF squash bugs are kept under control and they have room to travel. Each squash on the vines vary in size and color and number of warts or peanuts which are an indication of sweetness. What an odd looking pumpkin! 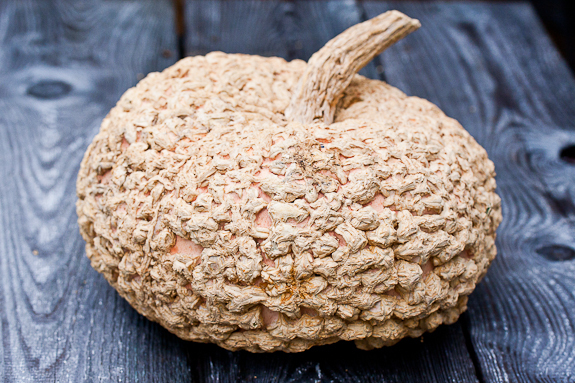 What an ugly pumpkin, I guess the old adage of you can’t judge by the outward appearance is true for this pumpkin. Great photos and story, soup looks lovely too. Could this look any better? What an amazing soup recipe…I can only imagine how decadent that first, flavorful bite must be! And with a warm loaf of bread…just perfect! I’ve never seen a pumpkin look like the heirloom one you found. How beautiful! Thank you. The soup was very good and much better than the versions I have made before. It really does matter which pumpkin you use for certain dishes. This one was recommended for soups and baking. Many are just good for baking. this looks gorgeous… and that pumpkin is definitely prettier on the INSIDE ! 😀 I have never seen a pumpkin like that. The “funky pumpkin”, I just like saying that, had a wonderful surprise inside, all of that orange, orange flesh. I’ve never seen a pumpkin like that before, but your soup sounds wonderful. In Chicago Land pumpkin season is almost over;(, so I’ll have to look for the “funky pumpkin”, next year. You should definitely try to find on if you can next year and make the soup recipe! 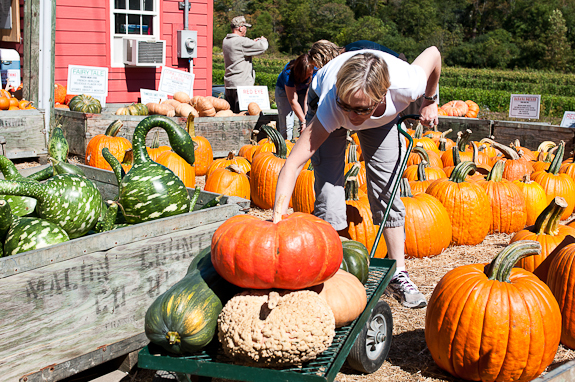 GASP – MY MARKET HAS THOSE PUMPKINS!!!! My 52 Sundays post about the market find in Broadripple a couple weeks ago showed all the pumpkins but we left out the photo of the pumpkin with all the ‘peanuts’ on the outside – I actually thought it was pretty but also thought it was an ornamental. I’m heading back to pick one up (will make sure to smell the stem first) and make this soup – shaking my head in disbelief! I thought these were just for decoration a few years ago, but then started to really look at their uses. I really am not sure why I didn’t try one until this year. Could it be that it was very cool to take photos of for the blog?! Maybe! I do know that this was the best tasting pumpkin soup I have made yet. Aw, sorry to hear about the rotten pumpkin. And thank for the tip on how to pick one out! Luckily i’ve never gotten a bad one but i can imagine how disappointing to get home all excited about your squash, only to cut into a rotten one. This soup look absolutely delicious though! And one heck of a scary looking pumpkin. Fantastic! I love the looks of that crazy pumpkin! The soup sounds divine! What a cool looking pumpkin! I don’t envy you for all of the cutting of that monster. My arm gets tired after just cutting up a little 3 pounder. But that soup looks totally worth the effort. Gweeeen! 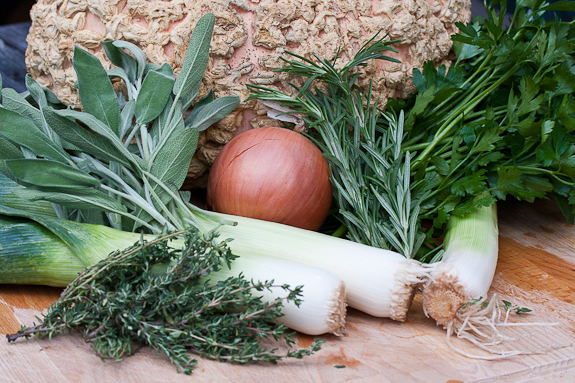 I luv this post and recipe…all those herbs. I’ve had my eye on a pumpkin soup recipe, but haven’t had the courage to try it yet having to make my own puree. Beautiful heirloom pumpkin. 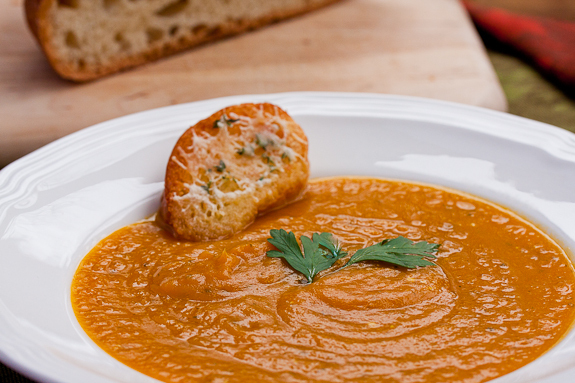 I want to look for a pumpkin patch this weekend and make this soup. Looks like this is the recipe to try this weekend. A neat looking pumpkin! What a fascinating looking pumpkin! The soup turned out beautifully – it looks wonderful. I bet the cheese toasts are delicious to dip in the soup, too. Gorgeous-ness in a post. I love the vibrant orange, and I love the vintage exterior of the pumpkin even more. You must have chopped forever, but it looks worth every ‘chop’! Fabulous bowlful this…yum! Brodé Galeux sounds so much nicer than Embroidered with Warts. Oh French, you probably make calling someone a Stinky Warthog sound beautiful (my knowledge of French sadly doesn’t extend to stinky or warthog). that is an incredible soup, you can see how rich it is in the picture! That pumpkin is quite a find, wow, it does look a little prehistoric! But the insides was beautiful, the colour was amazing!! I have to find one of those pumpklns and give it a try! Thanks so much for a wonderful post, and I can’t imagine your husband had any life BB!! this soup looks very comforting:) thank you for sharing. I love anything pumpkin (and French:). This soup looks divine! This is an amazing recipe! I just harvested my Cinderella pumpkins this week and I cannot wait to try it. I already baked and pureed 2 of them, I’m saving the littlest one for stuffing with a savory stuffing, French style, and that leaves me the other giants to play with …. Thank you so much for introducing me to this fine pumpkin, Galeux d’Eysines! I found one at a local church’s pumpkin sale and prepared it at home. It tastes like cantaloupe at first and finishes like cucumber — and that’s raw! And the soup was delicious. I will now make everything pumpkin-affiliated with this beautiful cultivar. 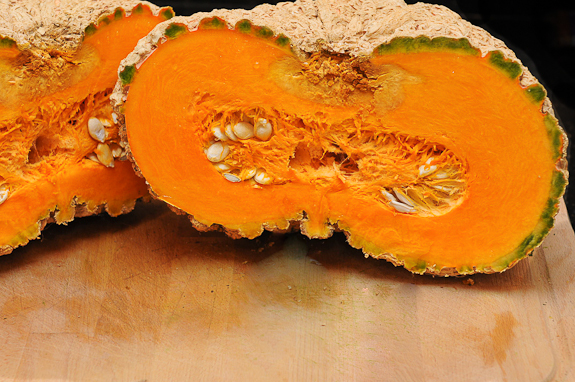 I am so glad that you were able to find one of these French Heirloom pumpkins and make the soup! I have had a few people tell me they thought they were strictly for decoration, so it’s great when you can introduce someone to new foods. We are headed to the mountains this weekend and hope to pick up a few more ourselves! I I am not a non-instruction type cook so I have to ask. How much nutmeg should I start with for taste? It’s in the instruction to “add nutmeg” but it’s not in the ingredients list. I’m also hoping it will come together okay without the leeks, because I can’t seem to find any here. I am so glad you found me, too and that you have decided to prepare French Pumpkin Soup with this amazing pumpkin instead of carving it up! Thank you for the catch on the nutmeg. If possible, use fresh nutmeg and grate about 1/4 teaspoon into the soup to start. Nutmeg is definitely one of those spices you want to add a little bit at a time, to taste. If you use jarred nutmeg, I would try 1/8 teaspoon. Keep tasting and adding it until you are happy with the flavor. Just remember, the longer you cook the soup, the more concentrated the flavor will be. As for the leeks, they are really important. You can substitute another onion and combine it with a few shallots for the sweetness, but definitely do not omit it all together. There is quite a bit of stock and pumpkin in this recipe, therefore, it needs a good bit of seasoning. Thanks for the quick response, Gwen! I went to the bigger grocery and found the leeks, and got the soup made tonight. I think I have too much liquid because it’s not orange (more of a green) and it’s not as thick as your picture looks. It tastes fantastic though, and the smell is simply heaven! It’s my first ever pumpkin soup so I have no idea if it tastes like it’s “supposed” to but it’s good to me! Someone suggested I add a can of pumpkin to help it along on the orange/thickness avenue but I don’t want to ruin anything. I’m not sure why your soup would be green if you used an entire pumpkin (5-6 lbs.) and followed the directions as they are written. I would suggest that you reduce the soup over the heat to get rid of some of the excess liquid. Let it sit overnight and see how it tastes tomorrow. The canned pumpkin would add a very different flavor to your soup, so I would wait and see how everything looks and tastes tomorrow. Gwen!! We entertained last night. Since I had a busy day, I scrambled to look for an autumn soup. I saw this and thought it’d be perfect. Unfortunately, I only had time to run to one market before doing some other things (had to get to a dog show), and they didn’t have this pumpkin! In fact, they didn’t have pumpkin at all, so I ended up with a butternut squash soup. BUT – I wanted to let you know that I TRIED. 🙂 The next time I see this one, I’m all over it. I’ve just returned from France and the best pumpkin soup. I goggled “French Pumpkin Soup Recipes” and your website appeared. I can’t wait to bring home this special memento. I have just tried this recipe. I was given some Galeux D’Eyesines seeds last spring and though I only got one to sprout, it did eventually produce a fruit. I harvested it a month ago and I was thrilled today when I saw your recipe and cut into the pumpkin and it was rich with big fat seeds. So glad you are going to make this soup with your pumpkin. I have one waiting to be used myself, so I know what’s for dinner one day this week. We do love this recipe. Enjoy! I hope to try your soup soon. I found the pumpkin that you have here. Was pretty excited to find while in Cape Cod last weekend. I pinned your pic to Pinterest but I think it was removed. ???? I don’t know what happened with you pin. I haven’t been on Pinterest lately. If you have a chance, try to post it again. I know you posted this a long while ago but I had to comment anyway. We grew these pumpkins this year, along with several others, and I wasn’t quite sure what I was going to do with them. They’re good roasted but this soup is amazing! My kitchen smells fantastic and the soup is warm and full of flavour without anything being overwhelming. Just wonderful, thank you! I hope you enjoy the recipe. 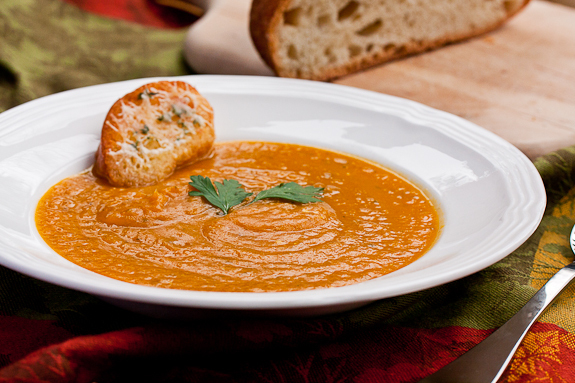 I need to find one of these pumpkins soon so I can make this wonderful soup again! Thank you so much for the recipe. We grew those pumpkins this past season, and I looked specifically for a recipe using them, which is how I found your recipe. I am a very picky eater and I don’t like soups to much, but I loved this soup. I used beef stock instead of chicken because that’s what I had, and I didn’t use parsley because I hate parsley. Although I do grow fresh thyme and rosemary, I used the dried equivelent. The soup still turned out excellent. Thank you so much for sharing it! 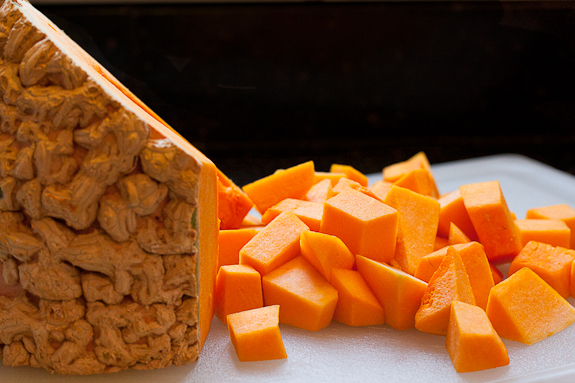 is the pumpkin good toeat as a side dish not just as a soup? 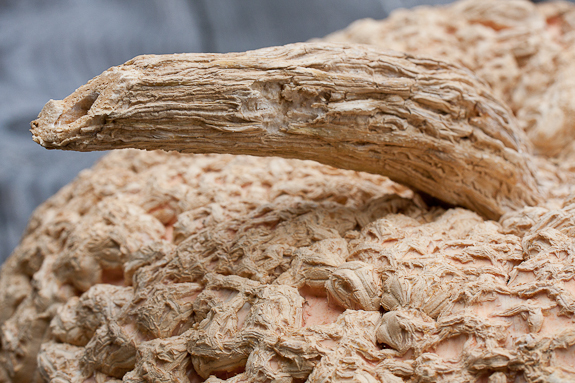 This type of pumpkin is best used for soup or baking. I would not make it as a side dish.